This super cuddly cozy cowly thing was born out of my frustration with trying to make this ridiculously bulky, irregular yarn into a sweater. It’s crap for sweaters, but perfect for something loose and cuddly. Alternating between K1P1 rib and stockinette (all knit) rnds keeps it from curling, and keeps the bubbles from clumping too densely. 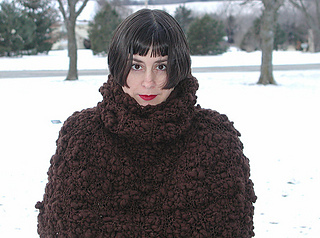 It knits FAST and would probably work with any bulky to gauge. The shoulders have raglan shaping, so it’s easy to adjust for other yarns by adding/subtracting increase rnds. This actually looks surprisingly cute over a jacket or coat, kind of loosely bunched over the shoulders. It gives a sort of Russian Winter vibe that way. I’ve shown it over my brown & black jacket, but I think it would be nicer over a contrasting color. 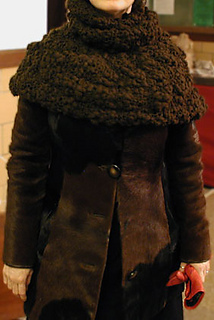 You can also wear the cowl as a hood.